A few weeks ago, over on our Facebook page, we told you that Daval’s kitchen and bedroom designer, Dean Weavill, had been shortlisted for the New Designer Award at the Designer Kitchen and Bathroom Awards. Well we’re delighted to announce that Dean actually scooped the award at the ceremony last night! 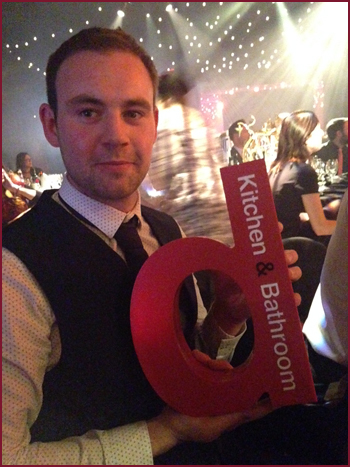 Dean won the award after submitting a case study using Daval’s Oakley in-frame kitchen. The case study showcased a renovation project which removed a wall between the kitchen and dining room to create an open plan kitchen living space. The doors and walkways were also moved so a natural flow between the kitchen and hallway were formed, and patio doors were introduced to bring in lots of natural light as well as capture the views. 3Style Kitchens is the official Wakefield supplier for Daval kitchens (and now bedrooms!) with the majority of kitchens we supply manufactured by them here in Yorkshire. MD Dean Clements picked up our own award this year, winning the Best Home and Garden Retailer award at the Wakefield Retail Awards so by choosing us you get a kitchen or bedroom from 2 award winning companies (in fact, 2 award winning Deans!). 1 Response to "Daval Wins New Designer of the Year Award"